You can run SoapUI stand alone but I prefer to integrate these kinds of tools with an automated process. Below you will find instructions for running SoapUI as a part of a maven build. This makes it possible to run your automated SOAP tests in Maven with a build process like Hudson. Combined with automatic deployment it is possible to support an agile software development process that supports frequent delivery of versions and continuous testing. Maven supports SoapUI with the Maven SoapUI plugin. Add the eviware plugin repository to your repository list. By attaching the SoapUI maven plugin to the verify phase your build process runs it automatically in the integration-test phase. The “iso-soapui-project.xml” is the reference to the SoapUI xml file. The log export of SoapUI can be interpreted like a normal Surefire unit report. 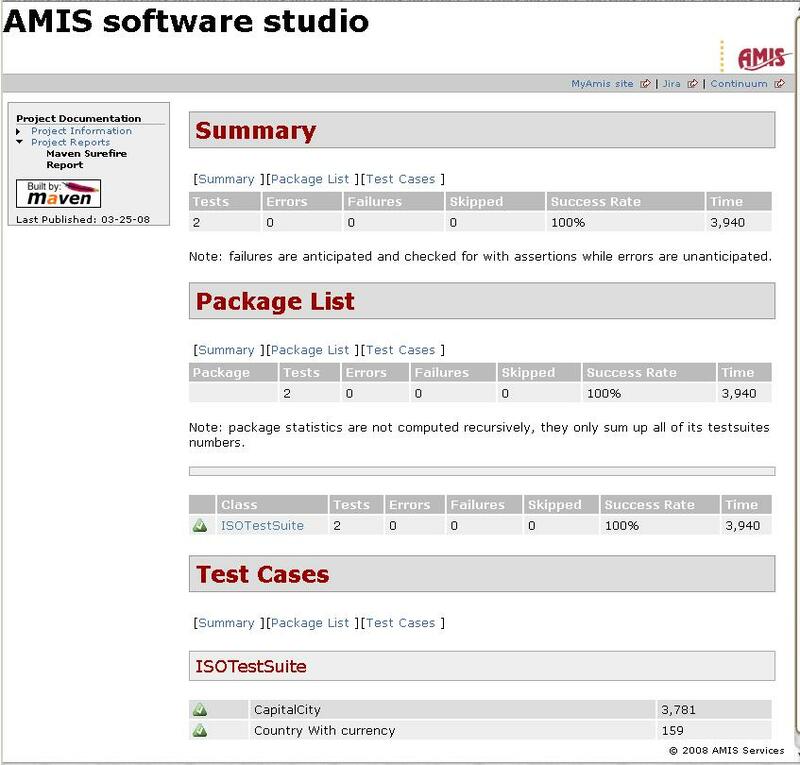 By just adding this part to your maven reports section you can generate a nice overview of your test results. The soapui-settings.xml file needs to be placed in your project root. Same location as your pom.xml. Alternatively you can add <settingsFile> to your soapui-plugin configuration. Is there a requirement that soapui-settings.xml file and the <projectFile> should be at the same level (directory)? And should the project file name end with soapui-project.xml? when i have the projectFile in src/test/soapui folder, i am getting an error that the projectFile cannot be found. – There are no costs involved. I do not know the exact licence structure of the Oracle tool. – Reporting is more accessible for end-users. Is there any realÂ benefit difference in using these tools as opposed to using the file transport protocol and reporting feature of OSB itself?Â Each can achieve automated testing?